UK publisher Austin Macauley is working from the Sharjah Publishing City to gain better access to the Arabic market. Plans are underway to publish English books in Arabic and vice versa. 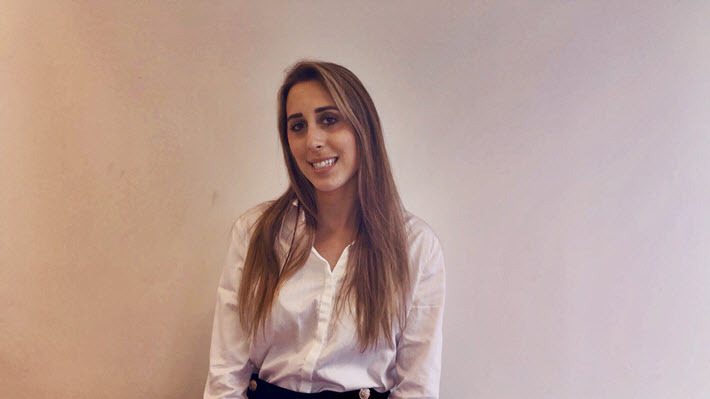 One of the attendees earlier this month at the Seminar on Arabic Literature in Translation in New York City was Jade Robertson, the international publishing director at Austin Macauley. She’s something of a business pioneer among the translation experts and book industry specialists who were gathered for the event organized by Publishing Perspectives, Frankfurt Book Fair New York, and the Sheikh Zayed Book Award. For months, Robertson has been developing and expanding the presence of the London-based independent house Austin Macauley Publishers at the new Sharjah Publishing City in the United Arab Emirates. As such, she’s the advance guard—a test case, in the eyes of some of her fellow publishing executives—as she works to open new channels into the Arabic world with a regional base of operations in the world’s first free trade zone developed around book publishing. Austin Macauley, founded in 2006 and now based in Canary Wharf, is no stranger to international expansion. The company has offices in Cambridge and New York City, and is opening a new office in Los Angeles specifically to house its international rights operations. New locations are planned next for Australia, South Africa, and Vancouver, as well. The company publishes a wide range of books, from commercial and genre fiction to memoir, history, children’s, young adult titles, and more. In April, Publishers Weekly recognized Austin Macauley as one of the fastest growing independent houses in the States, having signed more than 200 authors since 2017 and seeing book sales overall rise 330 percent between 2015 and 2017. Authors looking into the company’s offer are advised to consult with the Alliance of Independent Authors’ services-rating program, which has a “watchdog advisory” listing for the company. By year’s end, Robertson says, the company expects to begin releasing its first titles translated into Arabic. The Sharjah venture is a big one for the company, Robertson says. “We’ve been at Publishing City since October,” Robertson says, “and since then I’ve spent six months or more in Sharjah,” just learning the lay of the land in Arabic publishing and making the contacts that will take the company’s broad list into a new world market for Austin Macauley. 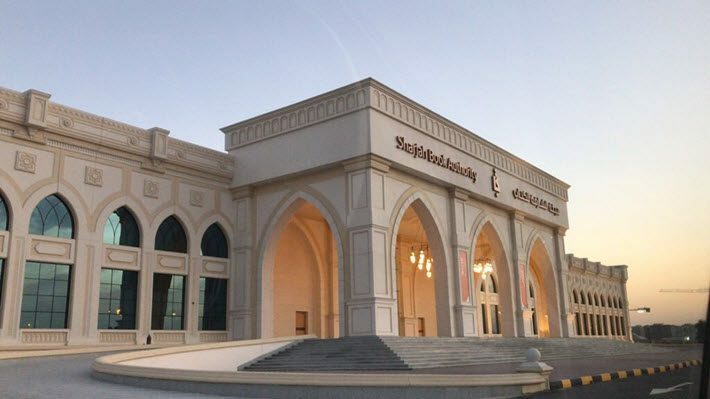 Readers of Publishing Perspectives are familiar with Sharjah Publishing City, the facility having been opened at the end of October by Sheikh Sultan bin Mohammed Al Qasimi, Sharjah’s ruler, the concept of Sharjah Book Authority’s Ahmed Al Ameri and led now with the assistance of consultant Mohamed Noor Hersi. 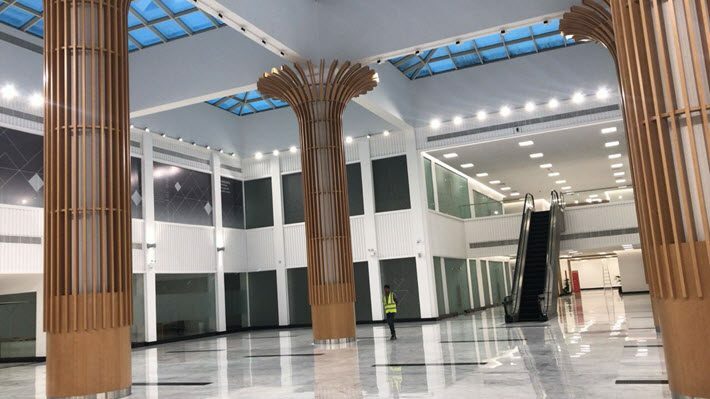 Among the 19,000-square-meter facility’s attractions are its promise of concierge-class assistance to corporate tenants, with services designed to ease a company’s entrance into the UAE’s business and residential requirements. “I think I had my Emirates ID within two weeks,” Robertson says, with the help of the center’s program. Robertson already has expanded the amount of space she’s leasing at at the sprawling facility–twice. “I took one office in October. And then another in March.” And in the late spring, she leased a section of the in-house warehousing space built into the ground floor of the building with load-dock access at the ready. “Sharjah’s got it figured out,” she says, with one of the key elements of the offer for her being in-house printing capacity, with which she’ll feel comfortable working. “I think a lot of people don’t understand the Middle East as a whole,” Robertson says. “It’s probably a little bit daunting for them. “But at Austin Macauley, we started to go through rapid growth about four years ago, and we saw that there was a demand for our titles in the States, so we opened in New York last January. We also were in talks with Ahmed [al Ameri] and Mo [Noor Hersi] about Sharjah Publishing City. And the reason behind doing that for us is that we were seeing a surge in inquiries from the United Arab Emirates and other Arab-speaking countries for our books. “It’s difficult for them to obtain good-quality English books. A lot of people in the region are highly educated,” Robertson says, adding that she’s been impressed that starting in April 2019, Sharjah will have its yearlong stint as UNESCO”s World Book Capital—the designation held this year by Athens. In addition to the Middle Eastern and Arabic approach, Robertson says, the company is keen on using Publishing City as a springboard into African and Asian markets, as well. “It’s easier to get books into those regions from Sharjah,” she says, “because the center has the warehousing facilities,” as well as office space and printing. “For us to keep sending books from North America or Europe becomes quite expensive. And there’s the shipping time,” to consider, she adds to the list of logistical reasons it’s making sense for Austin Macauley to create its base in Sharjah. Robertson has spent time at the region’s book fairs, and she sees there is an interest in reading among Arab young people, evident in the large groups of schoolchildren who crowd the aisles of the UAE’s major fairs looking for book covers that catch their eyes. “You know, kids in other areas,” she says, “are on their iPads,” juggling constant distractions in device-heavy cultures like those of the UK and USA. “You worry a little bit, you know? Is the next generation going to keep reading? Robertson is aware, she says, that geo-political perceptions can create psychological barriers for some. It’s helped her, she says, that she has a background in multi-cultural appreciation. And even with the support of the Publishing City program, Robertson doesn’t suggest that it’s a mere walk through the park to position an English-born company in the Emirates. “There are so many things you have to learn,” she says. “For example, you have to understand the National Media Council because of censorship issues. You have to understand the demands of the market,” and the trends that include “some piracy issues in the region”—another reason that in-house printing is important to her at the new facility. While not ready to name titles yet, Robertson says, “We’ve got quite a few good ones we’re producing at the moment.” Being a fan of the professional program that Sharjah International Book Fair produces each year, Robertson says she hopes to launch the new Austin Macauley Sharjah-based program during the Sharjah Book Fair. Robertson has high praise for the stately architecture and thoughtful design of Publishing City, and she’s an early adopter of its concept, she says, because as it builds out its offerings, it’s turning into “a place for one-stop publishing,” she says–attracting companies from various points on the supply chain to form a cooperative hub of production and distribution. It’s the kind of program, she says, that she’d like to see in other parts of the world where international expansion is becoming attractive. And as one of the first corporate tenants of the center, she says, “I’m willing to help other companies that might have questions I can answer. At the end of the day, I really am one of the first investors” in the project “and I understand what others might go through. In a way, I’ve jumped the hurdles for them,” the Publishing City management team, “and they’ve learned from me” about some of the finer points of what incoming companies might need. “It’s true that there’s so much to sort out,” she says, “in setting up a new operation in an entirely new part of the world. You’ve just got to be patient. Every country is different.” And Robertson says she’s a longtime self-starter when it comes to doing her own research. “But the team in Sharjah is well-connected,” she says, which is going to be a boon to other publishing players who may need more support. 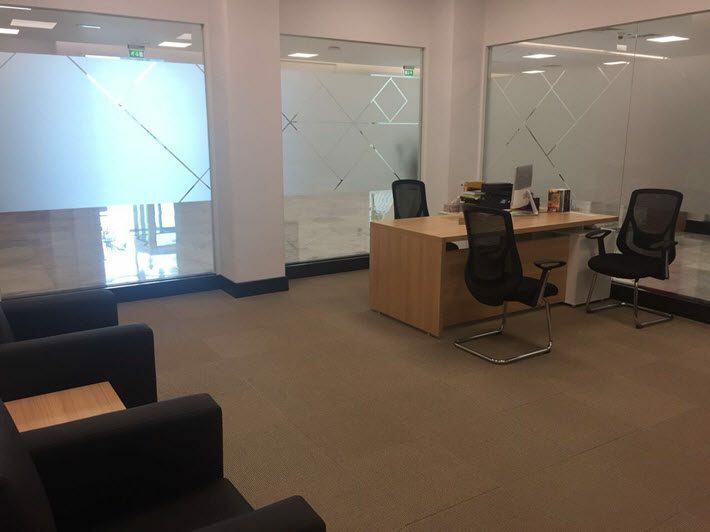 In five years’ time, Robertson says, she thinks that Sharjah “will have overtaken most of our offices and we’ll be doing more business through that one” than through most of the company’s other locations. A lot of this has to do, she says, with her perception of the Arabic market as being underestimated by many in the English-language markets—and others: she expects to have Spanish, French, and other languages being paired with Arabic, not just English, in her operation eventually. More from Publishing Perspectives on Arabic is here, and on Sharjah Publishing City is here.